Snipes and I went to the Sacramento Kings versus Los Angeles Clippers NBA game. We met before the game in the Sierra Nevada bar in the arena. This was a rare ESPN televised game with a 7:30 pm start time. The Los Angeles Clippers built and blew several big leads. Trailing by 20 points in the first quarter, the Kings cut the lead to 4 points with 6:32 in the fourth quarter. The Clippers answered with an eleven point run and won the game by the score of 133 to 121. Borden Bogdanovic was the leading scorer for the Kings. In 35 minutes, he had 26 points on 8 for 20 from the field, 3 for 6 from three and 7 for 8 from the free throw line. Buddy Hield had an off shooting night. He had 10 points on 4 for 13 from the field and 0 for 7 from three. The Clippers leading scorer was Tobias Harris. He had 28 points on 11 for 17 from the field, 3 for 5 from three and 3 for 3 from the free throw line. The Western Conference leading Clippers shot the lights out. They were 56% from the field and 43% from three. The Sanborns were at the game. Wandering up the aisle, Phil stopped and talked for a few minutes. 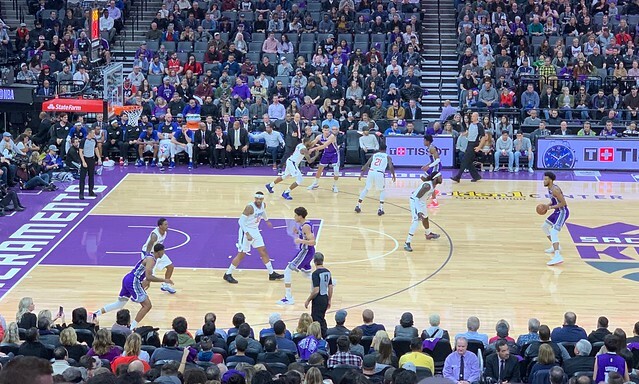 The Kings are now have 2 wins and 1 loss in games that I have seen in the 2018-2019 season.